This will be a different Ramadan. A Ramadan without Baba. In the picture above I have placed a pocket watch we found in Baba's things. It is an antique pocket watch and my dad had written on the bag Eglinton Ave E/Laird (where he bought it) and $5.35. Baba was such an organized man. Always thought of everything and made sure everything was in place. During Ramadan, iftari at my parents place was usually the tradtional waday, dahi baday and aloo bonday. All things Baba loved. He could never resist the Iftari. When my brother and I were still at home, Baba would buy baklava and chocolate every Ramadan. We would always have some at sehri/suhoor. May Allah forgive him and grant him Jannat-ul-Firdous. May Allah make this easy time for Mummy. Ameen. Today I am guest posting over at Yummy Food written by Lubna. I have always admired Lubna's amazing photography and visit her blog often! Every Ramadan Lubna hosts the event Joy from Fasting to Feasting where we would all link up our Ramadan recipes. This year she is changing it up and has asked bloggers around the world to share recipes that they make often during Ramadan. So far we have seen some very yummy dishes! Although I grew up on the traditional deep fried Iftar that is typical of our Hyderabadi cuisine, after getting married I became more health conscious and wanted to avoid eating our traditional Iftari everyday. Although it is so delicious it would make me feel so heavy and tired later because to be honest I can't resist it. So last year I started to make smoothies for Iftar. It helped us get some much needed hydration and it was a easy way to get the fruits and vegetables we were missing in the day. 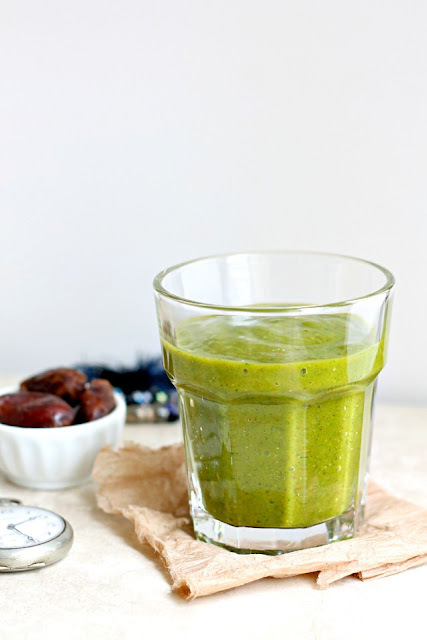 So today I'm sharing a Mango Date Green Monster over at Lubna's blog. Please hop over to check it out and the other Ramadan recipes my fellow bloggers have shared! Sis,very heart touching indeed and seeing your loved ones treasure and those memories is unexplainable..I do have the same feelings when I see my moms books and her things.May our Almighty bless us all and do include us in your duas.BTW this drink looks very healthy and colourful. Our parents are the biggest blessing that Allah has bestowed on us. May Allah grant your father the highest ranking jn Jannah. It is evident from your words that he was an amazing man, and I pray that Allah gives you the same qualities that you found so admirable in him. Ameen. Hope everything went well today...sent you an FB message. May Allah grant Jannatul Firdous to your Baba. As you know Ramadan is the best time for making dua, remember to make lots of dua for his maghfirah during this month. It's the best gift that you can give him.Even I have started to look for healthier alternatives to traditional iftar snacks but can't resist them once in a while. This one is definitely a super healthy choice.